Worried about rising pollution? Yesterday Xiaomi launched an air pollution mask called the Cloth Pear Fresh Air Mask in China. The mask is a product of Xiaomi’s most recent crowdfunding effort and is available to customers for CNY 89 (approximately Rs. 900). Weighing 50.5 grams and built with high-fibre textile, The new air mask comes with double detachable design, an ultra-thin fan, with 3-level speed, a power-on button, charging support, individual air volume memory and a knob type filter cartridge which can be replaced. The battery is a polymer lithium-ion setup and takes about 3-4 hours to charge. The company claims that the filter can filter up to 99 percent of PM2.5 particles. This is a first anti pollution mask by Xiaomi, though the company has manufactured air purifiers for some time. Recently Xiaomi launched the Mi Air Purifier 2 in India for Rs. 9,999. The Mi Air Purifier 2 has 360-degree air intake and is armed with an EPA filter to filter airborne particles. The EPA filter has three layers and can remove particles larger than 0.3 micrometers. Then there is an activated carbon filter that is supposed to remove bad odour. The Purifier has a Clean Air Delivery Rate (CADR) of 310 cubic meters per hour. The company claims that the purifier can circulate clean air in a 21sqm room in 10 minutes. India much like China is rapidly industrializing and consequently has witnessed an alarming rise in pollution. The post Diwali smoke haze in northern India has finally forced the country to recognise the problem. 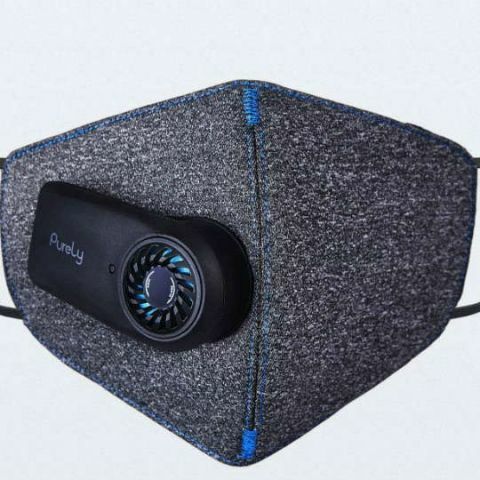 And while solutions to the problem may take some time to be conceived and implemented, products such as the air purifier and the mask are sure to find some buyers.